For almost a century, it has been the home of Parma’s football club. The stadium was named after Ennio Tardini, who played a vital role in the construction of the stadium. Unfortunately, he could not enjoy its inauguration (on September 16, 1924) because of his premature death the year before. Tardini, a philanthropic Parmesan lawyer, partner of the Parma Football Club (founded on December 16, 1913), and its president from 1921 to 1923, worked to achieve many important goals in the city, was a person of modesty, integrity, and was unaccustomed to the spotlight. The stadium’s brick-laying ceremony occurred on December 26, 1922, directly after a 2-0 victory at the old stadium (The Stradone) in the derby against Reggiana, and because of the match Tardini was unable to participate, despite the major role he played in the planning of the stadium. The stadium was originally built with a bike track, and a gym for gymnastics and exercises. The purpose of the stadium was not only football, but other activities such as cycling, rugby, and athletics. It is no coincidence that the original title bore the name “Multisport”. For four decades it was mainly used for soccer, but it was always prepared for other sporting events. Football matches were played so much more frequently than other sports that the configuration of the stadium was altered. The track was eliminated, grandstands were built on the western and eastern sides of the stadium, and bleachers were built on the north and south sides. 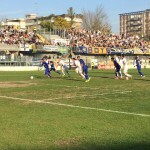 The Tardini is owned by the municipality of Parma, but operated by Parma Calcio 1913, boasts a capacity of 22,352 seats and is one of the oldest stadiums in Italy. Two things make the Tardini stand out among other stadiums. One is the famous monumental entrance, but above all, the close proximity of the stadium to the city center and the ease of reaching the field is what makes it truly unique. Its centrality in the urban fabric of Parma is considered a significant advantage in regards to the rituals and customs of the fans. The Collecchio Sport Center was built in 1996 and renovated in 2013. It is located 15 kilometers southwest of the city of Parma. It consists of five regulation grass fields, one with synthetic grass, and one covered with artificial turf, with reduced dimensions. One of the five fields has a capacity of 1200 seats, and at the center are facilities for the first team and the youth teams. In addition to the dressing rooms, there are two gyms, two rooms equipped for physiotherapy, several rooms for medical studies, and a pool. Flanked by the sports facilities is the managerial center, housing different offices, meeting rooms, the media room, a restaurant, ten double bedrooms and two suites. Parma Calcio 1913, saw the value of this complex on a technical and human level, as well as its ability to foster a sense of belonging to the club and allowed the youth teams, starting with the pulcini, to train at the complex. This gave rise to the name “Crusaders Village”.